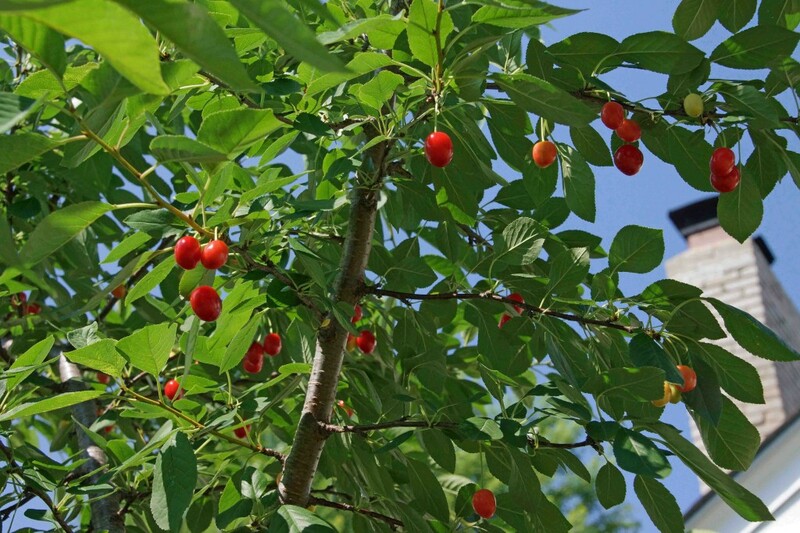 The first summer I lived in my house, I planted a cute little cherry tree in the front yard. 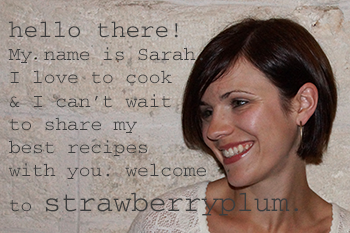 The second summer I lived in my house, I made 1 tiny jar of pickled cherries. The third summer, I made a batch of cherry scones. Last year, we had a messed up budding/frosting situation and I ate my yield of 3 cherries right off the tree. This year, I was really hoping for a deep-dish, double-crusted cherry pie. That didn’t quite happen, but I did have enough to make a pretty almond meringue tart. Luckily, it turned out tasty enough to leave me thinking if I still don’t have enough cherries for a pie next year it’ll be okay. Let’s go pick cherries! Head to your front yard or the market and get your hands on about 2 cups of tart cherries. We’ll whip up the tart crust first and let it chill before we tackle the filling. You know the basic drill–cut cold butter into flour, moisten with a couple of egg yolks, and bring it all together with ice-cold water. I prefer to make my crust by hand but can never find my dang pastry blender when I need it. Thankfully, the food processor is harder to lose and will also do the trick. 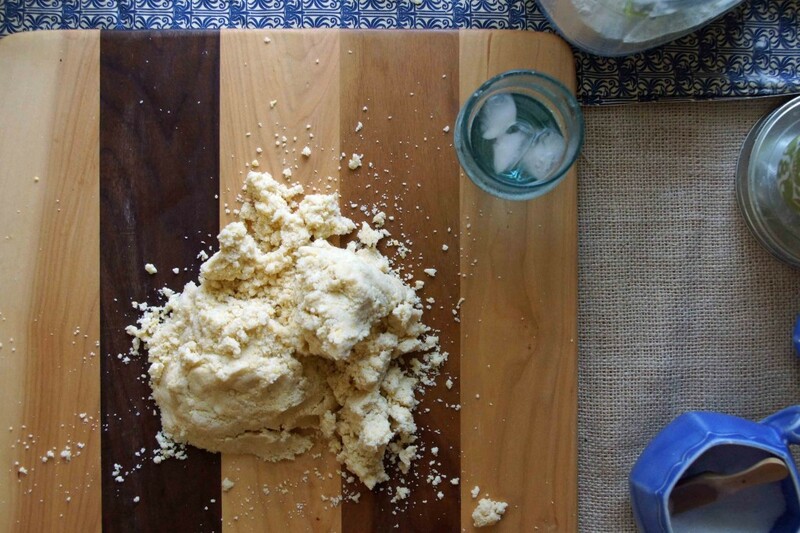 When the dough is just wet enough to stick together, dump it out onto a board or the countertop and press it into a disk. Wrap it tightly and let it chill out for a few hours. Dare you to follow its lead–kick your feet up and chill yourself out for a while. Roll the chilled dough into a circle and press it into a tart pan with removable bottom. Put it back in the fridge while you take care of the filling. Cold is key! Preheat the oven while you make the almond meringue. Sweeten eggs whites and beat into frothy peaks. Fold in sliced almonds and lemon zest, then spread in the chilled tart shell. Time to break out the cherries! Scatter them over the meringue or if you’re feeling like a perfectionist, swirl them into a pretty spiral. Pop the tart into the oven where it will rise and brown into something of true beauty. Let the tart cool completely on a rack in front of an open window and pray one of those pesky cartoon pie-thieves doesn’t happen to be in the neighborhood. Cut yourself a big slice and brew a pot of coffee. Yes, this will do nicely until our cherry harvest is more substantial. 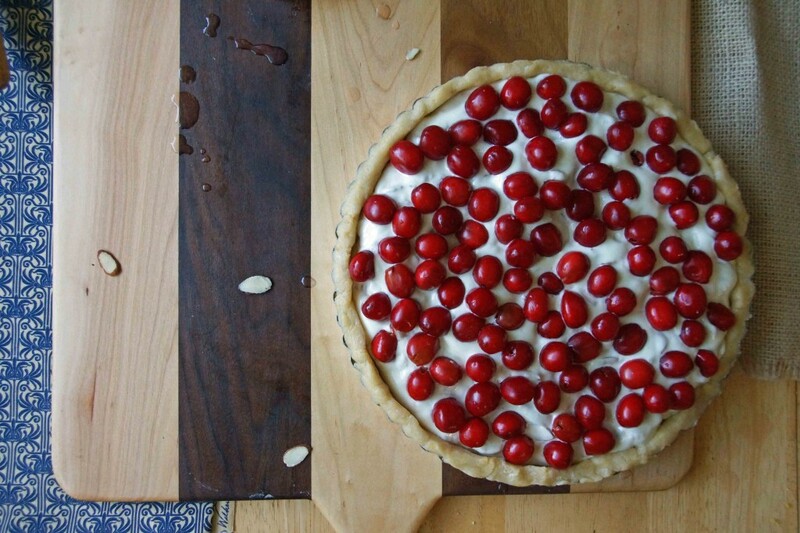 Tart Cherries provide an excellent contrast to the sweet meringue filling. 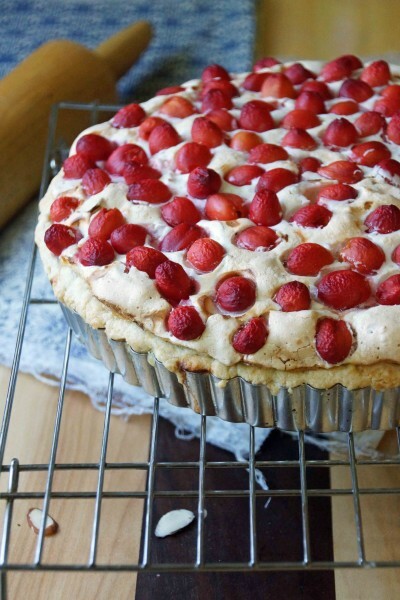 You will need to make and chill the tart crust several hours before you intend to fill and bake the tart. You could certainly make the dough a day or 2 in advance, if you prefer. Combine the flour, ¼ tsp salt, and 2 Tbsp. sugar in the bowl of a food processor (alternatively, you can make the dough in a large bowl, using a pastry blender). Pulse a few times until the dry ingredients are well combined. Scatter the cold butter pieces over the dry ingredients and pulse in 12-15 short bursts until the mixture has a crumbly appearance. Add the egg yolks and pulse a few more times to incorporate. Add the iced water, 1 Tbsp. at a time, and pulse until the crumbs just begin to stick together. Dump the dough mixture onto a countertop or board and press together to form a disk. If the dough seems to dry and won't hold together, add a tiny bit more water. Wrap well with plastic and chill for at least a couple of hours and up to a couple of days before proceeding. 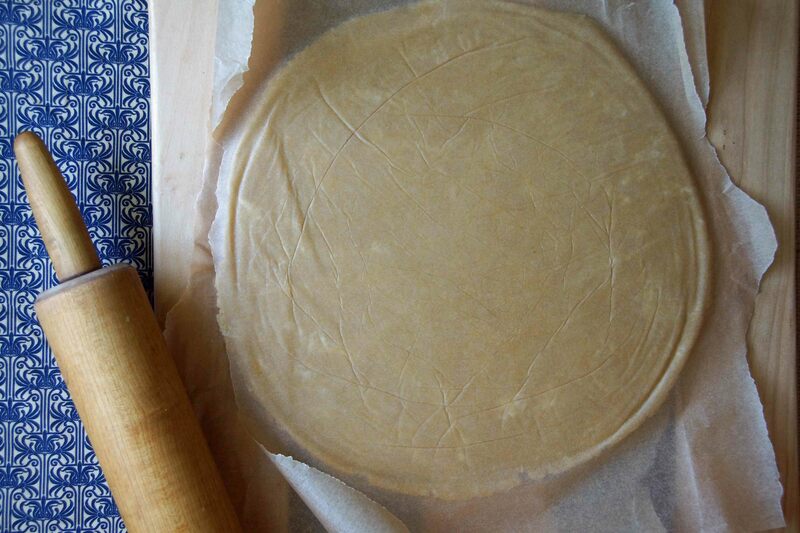 Roll the dough between 2 sheets of parchment or waxed paper into an 11 in. circle. Remove 1 piece of paper and flip the dough into a 9 in. tart pan with removable bottom. Remove the top piece of paper and firmly press the dough into the pan, evening the edges and patching, as needed. Place the tart shell in the refrigerator while you prepare the filling. Preheat the oven to 350°. If you have a pizza stone, place it in the oven to bake the tart on--it will help it cook from the bottom and prevent a soggy crust. 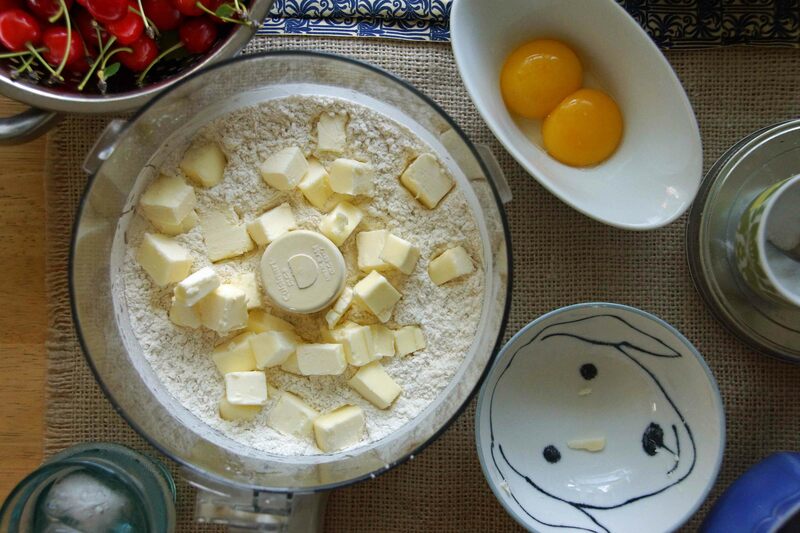 Place the egg whites in the bowl of an electric mixer along with a pinch of salt. Whisk on medium speed until the whites begin to look foamy. Slowly add the sugar as you increase the speed to high and the whites begin to expand. Add the lemon zest and continue to whip until the whites are glossy and hold soft peaks. Using a rubber spatula, gently fold in the almonds in 3 additions. 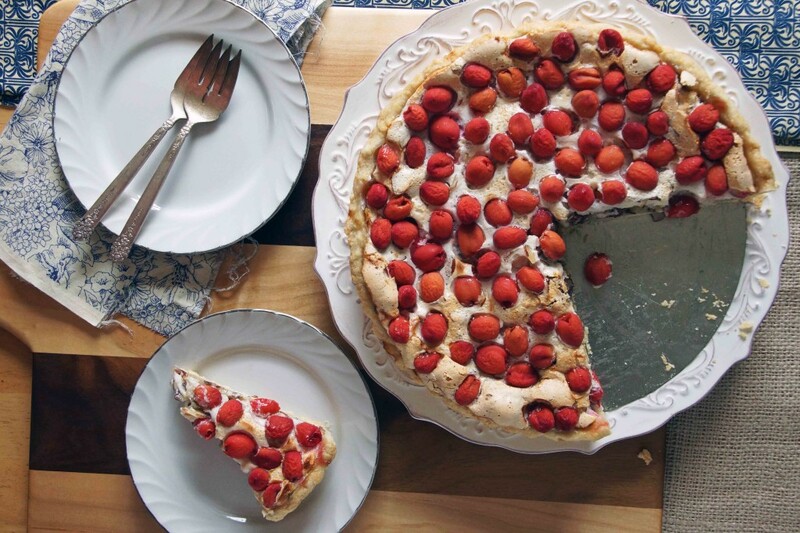 Evenly spread the almond meringue in the chilled tart shell. Scatter the cherries over the top of the meringue and gently press with your palm so they'll stay put as the meringue rises. 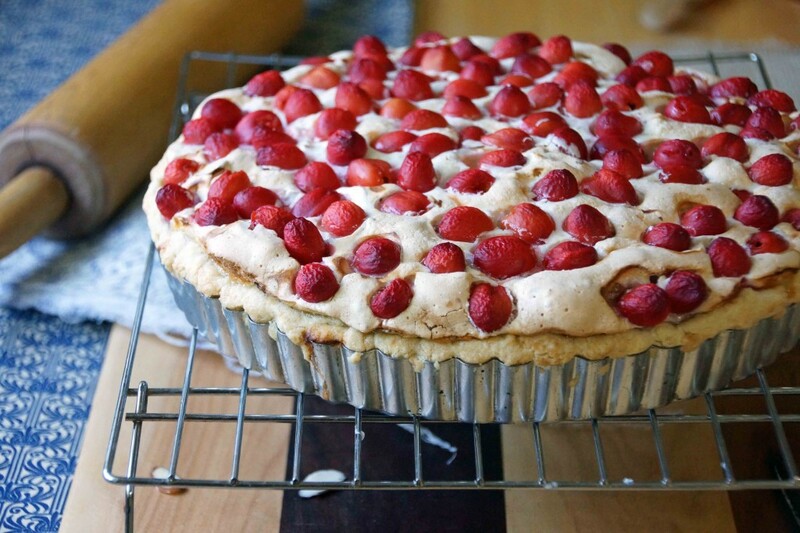 Bake on the heated pizza stone until the meringue is lightly golden and set, 45-50 minutes. Cool completely on a rack before serving. 20 pounds!! I can’t begin to imagine pitting that many cherries!